TD Ameritrade Inc.’s retail advisory service this week received a green light from securities regulators to offer a full refund of fees to customers whose investment portfolios decline in value. The brokerage plans to offer the rebate to new clients of its Amerivest managed-accounts service, which currently costs between 0.3% and 1.25% of assets annually, if their investments post negative returns in two consecutive quarters. TD Ameritrade professionals will manage your portfolio based on a risk tolerance questionnaire. The deal is that if you use this service and see two down quarters in a row you get to recoup your advisory fees. As with most sales pitches in the finance industry, this sounds great in theory, but leaves much to be desired in reality. Unfortunately, these types of offers always come with unintended consequences because we humans are guided by incentives above all else. If earning positive returns over any six month period is one of the main goals for these managed funds there could be a huge misalignment of risks. Certain clients could have a high tolerance for risk and be able to withstand periodic losses but the portfolio managers would be incentivized to dampen volatility to avoid drawdowns and fee rebates. Many investors have learned the hard way that trying to beat the market over shorter time frames can be more trouble than it’s worth. A singular mission to outperform can actually lead to underperformance. The same logic applies when trying to minimize losses. A sole focus on downside protection usually leads to the opportunity cost of no upside participation. An illusion of safety in the short-term can lead to problems in the long-term. Judging your portfolio or your financial advisor over a six month period is a recipe for failure. No strategy can be assessed over that short of a time frame. Also, while fees are important over the long haul, investor behavior is much more important. Investors need to make sure they aren’t sacrificing other areas of portfolio management in a push to only reduce fees. Lower investment fees are only one of the many risk management techniques needed for a successful portfolio. 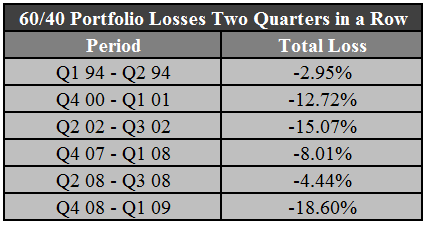 It’s happened six different times since 1992 if you count the six quarterly losses in a row from 2007 to 2009 as three different instances. So around 14% of the time or just under once every two years. Losses are inevitable in the markets, but most of the time stocks and bonds have gone up historically. The problem with a complete aversion to risk is that it can lead to a lack of rewards. Risk management is prudent while risk avoidance can lead to unintended consequences. But I do still think bonds can serve a purpose for rebalancing and capital preservation needs during market selloffs. Just have to reign in expectations for future returns.